By John Riddell. Toronto City Council unanimously adopted a series of motions on April 1 seeking to protect residents against transport of toxic oil products by pipeline and rail. While the motions have no legal effect, they mark an important victory for local ecological campaigners and all Toronto residents. Most notably, the council voted 28 to 4 to ask the Province of Ontario to “conduct a comprehensive environmental assessment of the Enbridge Line 9B application” – a project to run diluted tar sands oil (“dilbit”) through an aging pipeline (“Line 9”) that cuts across the city (see “Ethical Enbridge?”) The vote, on a motion by Councillor Mike Layton, was a slap in the face of Canada’s federal government, whose National Energy Board (NEB) had approved the project March 6 in a decision aimed at shutting down controversy over the troubled project. Over the last year, anti-Line 9 campaigners gathered thousands of signatures for the environmental assessment proposal and met with councillors from across the city to explain its merits. The assessment would not in itself stop Line 9, but, if implemented, it would obstruct federal government’s rush to get the tar flowing and open the door to the democratic consultation that was smothered in the NEB process. The council bundled this measure with other moves to obtain information on the secretive project and involve the city in the ongoing regulatory process. 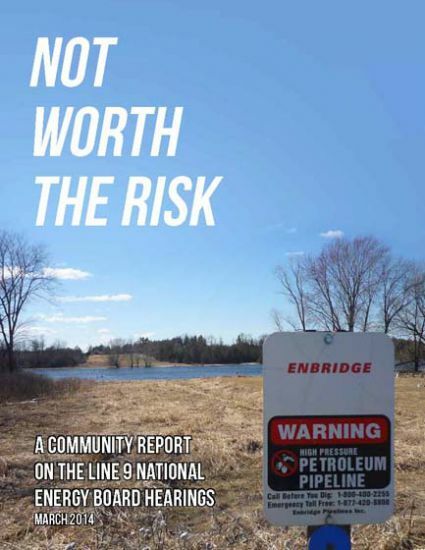 One such proposal, made by Councillor Anthony Perruzza, urged the provincial government to “follow up on any outstanding concerns not addressed” in the NEB decision – which rejected every significant proposal by the Province and by municipalities and indigenous communities along the route of Line 9. The Province itself had asked the NEB to order an independent review of the project, a call that the Board had scornfully rejected. Yet a spokeperson for Ontario environment minister Jim Bradley rejected the Toronto environment assessment proposal out of hand, saying that only the federal government, firmly committed to expanding tar-sands pipelines, could carry out such a review. The entire Canadian big-business elite has bought into fantastic plans to qualitatively expand tar-sands extraction as central to the future of Canada’s economy. The tar-sands tycoons have faced stubborn opposition to pipelines that would expand export of their projects running both west (“Northern Gateway”), south (“Keystone XL”), and east (“Line 9”). Prime Minister Stephen Harper has mobilized Canadian diplomacy to badger countries into accepting Canada’s tar sands oil, converting Canada into the world’s number #1 climate criminal. All the more significant, then, are the initiatives by Toronto city council, which is not known for its radicalism. Even the city’s erratic right-wing mayor, Rob Ford, a strong Harper supporter, voted for the combined motion advocating a provincial Line 9 review. This outcome reflects the effectiveness of anti-Line 9 campaigners, who went to the streets with their leaflets, petitions, and lawn signs to arouse broad opposition and then took the message from the streets to the city councillors. In the process, they produced a comprehensive report on the NEB hearings on Line 9, “Not Worth the Risk,” which was presented to councillors by activist delegations. But the anti-Line 9 movement, though it rallied thousands, has not yet taken on mass proportions. Its successes, in themselves, are not sufficient to explain the Toronto City Council decision. Another factor is at work. To understand it, we must look at what happened in another portion the council’s April 1 meeting, which took up railroad safety. On July 6, 2013, a train of tank cars carrying “Bakken oil” from North Dakota for export blew up in Lac Mégantic, Quebec, destroying a large part of the town and killing 47 residents. An inquiry into the causes of the explosion is still under way, but evidence points to three main causes: (1) inadequate safety measures by the railway company; (2) the fragility of Class 111 tank cars used on the train; (3) the inflammable nature of Bakken crude oil. Although authorities keep mum, it is clear that the train that blew up in Lac Mégantic passed through central Toronto on a CP Rail line. Bakken oil is produced by hydraulic fracturing (“fracking”), which injects a water-sand-chemical mix into rock formations under high pressure, degrading the water supply and endangering the environment in a fashion similar to tar sands extraction. Pushing to get fracked and tar-sands oil to market, oil companies have turned to the railways. Shipments of crude oil by rail increased in Canada from 500 car loads in 2009 to 160,000 car loads in 2013. More than 200,000 of the vulnerable Class 111 tank cars have been pressed into service. Since 2008, at least ten oil-shipment trains have derailed, touching off fires in most cases, and spilling almost three million gallons of oil. Councillor Cesar Palacio, whose ward, like Matlow’s, abuts the CP Rail line, called for the federal government to look for “alternative modes of transporting hazardous materials” and “re-routing trains” carrying such cargoes “to avoid heavily populated centres.” His motion, like Matlow’s, was approved unanimously. Once again, these motions are symbolic: they have no legal effect and did not get much media attention. But for environmental activists, they are important. Here, too, public unease has been sufficient to push a conservative city government to “interfere” in federal politics and make a show of defiance of an arrogant oil industry. The good results of Toronto’s April 1 council meeting are a signal to environmental activists that conditions are more favourable now to challenge government and corporations on issues related to climate change. Street-level campaigning has confirmed that unease over Line 9 or oil shipments by rail involves more than concern over neighbourhood safety. There is now more awareness that these dangerous products are linked to escalating climate change and thus harmful to the world. Moreover, two extreme weather events during the last year, both involving substantial inconvenience and losses, have brought home to many that the city is beginning to feel the impact of climate change. The Toronto council’s unusual rail and pipeline initiatives may well reflect not just effective activist campaigning but a broadened popular concern over a range of issues linked to climate change. In this encouraging context, the varied Toronto activist groups that contest Line 9 assembly are renewing and broadening their efforts. John Riddell is a member of East End Against Line 9. On April 24, his committee will host a discussion on “Could a Lac Mégantic Rail Tragedy Happen in Toronto,” to be led off by City Councillor Mary Fragedakis. For details, see Facebook: Toronto East End Against Line 9 or write info@eastendnotar.org. Submitted by Sakura Saunders on Mon, 05/19/2014 - 22:40.